Starting new traditions – our recipe for Easter bread ‘baskets’ with Castello Cheddar and oregano is a fun and delicious way to bring some innovation into a traditional setting. The cheddar, fresh oregano and nigella seeds will make this savoury bread tasty on its own. Happy Easter! 550 - 600 g plain flour, reserve 50 g for kneading should the dough be too wet. 1. Warm the milk and butter in a saucepan. Pour the warm milk and butter into a mixing bowl and combined with the salt and beaten eggs. 2. Stir the active dry yeast into the flour. Then add the grated Castello Mature Cheddar and fresh oregano to the flour mixture and combine. 3. Now add the flour mixture to the wet ingredients a little at a time and knead thoroughly, preferably using an electric mixer, until the dough is firm and smooth. 4. Cover the dough and let rise for about 1 hour until double in size. 5. Paint the eggs the desired colour and let dry. 6. Knock the dough down and divide into 12 pieces. Roll each piece into long ‘ropes’ 2½ cm thick and 30 cm long. Take two pieces of ‘rope’, twist them together and arrange in a ring/basket. 8. Repeat the process with the rest of the dough. Place the baskets on 2 baking sheets lined with baking parchment. Cover with a cloth and let rise for 1 hour. 9. Carefully place a coloured Easter egg in the centre of each basket. 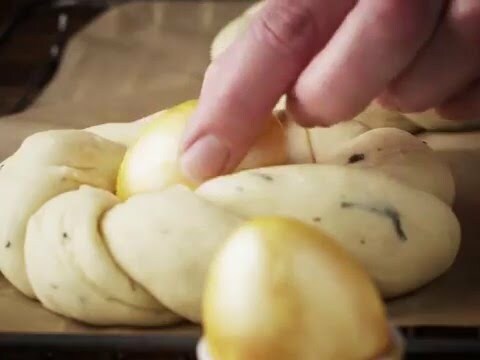 Brush the dough with the egg and water and sprinkle with nigella seeds, then bake in the middle of the oven at 200°C for approx.19-20 minutes. Cool on a rack and serve for Easter.